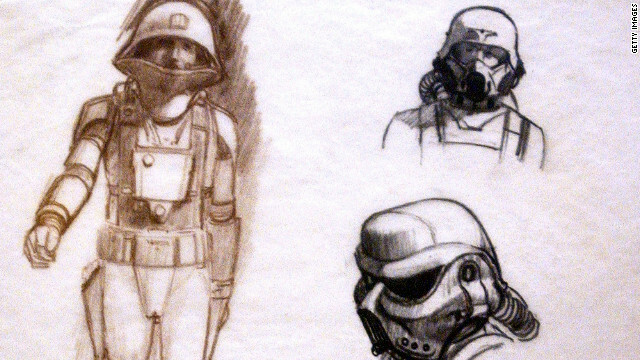 Early images of "Star Wars" stormtroopers and Imperial forces, as rendered by Ralph McQuarrie. "Star Wars" fans were in mourning Saturday when it was announced that Ralph McQuarrie, the conceptual artist on the original "Star Wars" trilogy, died at the age of 82. "Star Wars" creator George Lucas put out a statement, saying, in part, "Ralph McQuarrie was the first person I hired to help me envision 'Star Wars.' His genial contribution, in the form of unequaled production paintings, propelled and inspired all of the cast and crew of the original 'Star Wars' trilogy." McQuarrie continued to work on other favorite franchises and films for the geek community, designing iconic creatures and characters in the original "Battlestar Galactica," "E.T. The Extra-Terrestrial," and "Close Encounters of the Third Kind." Fans, for whose discovery of McQuarrie's extraordinary art over the decades can often send one's imagination into orbit, had a lot to say about this loss over the weekend. This news has hit me harder than I expected it to. As a kid I had his artwork on my walls and looked in awe through the portfolio set of his artwork from "Star Wars." Without Ralph McQuarrie we would not have Star Wars, plain and simple. George Lucas’ script was being turned down left and right. Nobody was understanding his vision. Lucas realized he couldn’t count on a studio exec having even a small amount of imagination and sought out Ralph McQuarrie to do a series of production art pieces that would visualize the world. Lucas’ first pitch with McQuarrie’s art laid out before him was at 20th Century Fox and you know what happened next. If that had been McQuarrie’s complete legacy we would owe him our eternal thanks, but not only did he grasp the story and imagery Lucas was desperate to put on screen, he set the template for the universe. Back in my youthful days I remember being mesmerized by the alternate reality suggested by his image of Luke, with breathing apparatus, having a duel with Vader in Star Wars, and by the thought of what it would have been like had the Stormtroopers carried lightsabers. He was responsible for creating the paintings of C-3PO, which you can see from the image below shows some influences from "Metropolis," light sabers, and even the Death Star. These pre-production images were a crucial element in getting 20th Century Fox to back Star Wars – to show that the project was something more than “trashy science fiction.” It makes you wonder if the Adventures of Luke Starkiller stood a chance without him? It’s amazing to think that one man created some of the most iconic images that ignited my generation’s imagination, images that continue to define our visions of the future, as well as the future of sci-fi cinema. He will be missed. McQuarrie's hands are all over the three original "Star Wars" films, on which he worked as a production illustrator, design consultant and concept artist. He designed Darth Vader. He designed R2-D2 and C-3PO. He designed Chewbacca. Indeed, it was McQuarrie's vivid concept paintings, all done on the strength of nothing but George Lucas' script, which helped convince studio executives to green-light Star Wars in the first place. McQuarrie appears briefly as a Rebel General in "The Empire Strikes Back," and later won an Academy Award for his work on 1985's Cocoon. If you love Star Wars, a lot of what you love is down to the work of this man. His contributions to the enduring popularity of the original trilogy simply cannot be understated. Who of us didn’t have at least one McQuarrie painting hanging on our bedroom walls as kids or teenagers? I had more than a few and I’m sure you had a couple as well. At Star Wars Celebration V, I made the time to spend well over an hour in the display of his artwork and I said then, and I’ll say again now, that it was one of the most impressive and awe-inspiring displays of art I’d ever seen. Even just the work scribbled in his notebooks was something to marvel at. McQuarrie was memorialized on Twitter as well. Lucas' Industrial Light and Magic tweeted, "Ralph's contribution to cinema will be remembered – Always." Actor Anthony Daniels said, "Without his inspirational art I would not be C-3PO. I once said to him, 'This is all YOUR fault!' Then I thanked him." Simon Pegg called him, "an extraordinary artist whose work fueled my dreams, fantasies and imagination. His paintings will live forever," while his fellow actor Elijah Wood called his death "a disturbance in the Force." Actress and mathematician Danica McKellar tweeted, "He defined the look of an entire generation of great films and inspired millions." Comic book artist Robert Liefeld said, " I pored over his Star Wars designs as a kid! Brilliant illustrator." Ain't It Cool News founder Harry Knowles said, "Ralph McQuarrie dying feels like one of my patron saints has gone away. He's a name that when fellow geeks hear, they explode with enthusiasm." Author Kevin J. Anderson said, "I worked closely with him and was proud to consider him a friend." He posted memories of their time together at his blog. Writer/producer Javier Grillo-Marxuach wrote, "A few years ago, I had the honor of touring the Lucasfilm Archives. The highlight of that trip was seeing Ralph McQuarrie’s original concept art. To personally view these seminal works was as powerful an affirmation of the creative impulse for me as seeing Picasso’s Guernica or the Mona Lisa. McQuarrie’s images were the visual fountainhead of a story that ignited my imagination at a young age and put me on the course to become a professional in television and film. Both his influence in our popular culture and my gratitude for his work are beyond measure." Wow, these are awesome! Thanks for ptniosg these! Admitting my nerdness, I just starting reading the expanded universe books .Is there a good place to buy prints of those? This man must have had Naziesque tendencies to come up with all that Nazi shaped and designed outfits!!! @netanyaho: actually, the Imperial motif was due to the fact that the Galactic Empire was fascist, similar to the German Third Reich. It had nothing to do with the conceptual artist's leanings. That's also why the Imperial TIE fighters "screamed" like the German Messerschmidt dive bombers of WWII. Although I wasn't a rabid fan of Star Wars, I did have a great amount of respect for the talent it took to design and create the massive body of work that it finally became. For that, the passing of Ralph McQuarrie makes me sad. My kids were at the right age to fall hopelessly into the fever pitch that was the Star Wars trilogy. Chewbakka dolls, Millinium Falcons and Princess Leah hairdos that looked like 2 cinnamon buns on the side of the head and all. RIP, man I didn't know about.